What does being a nomadic family mean to us? 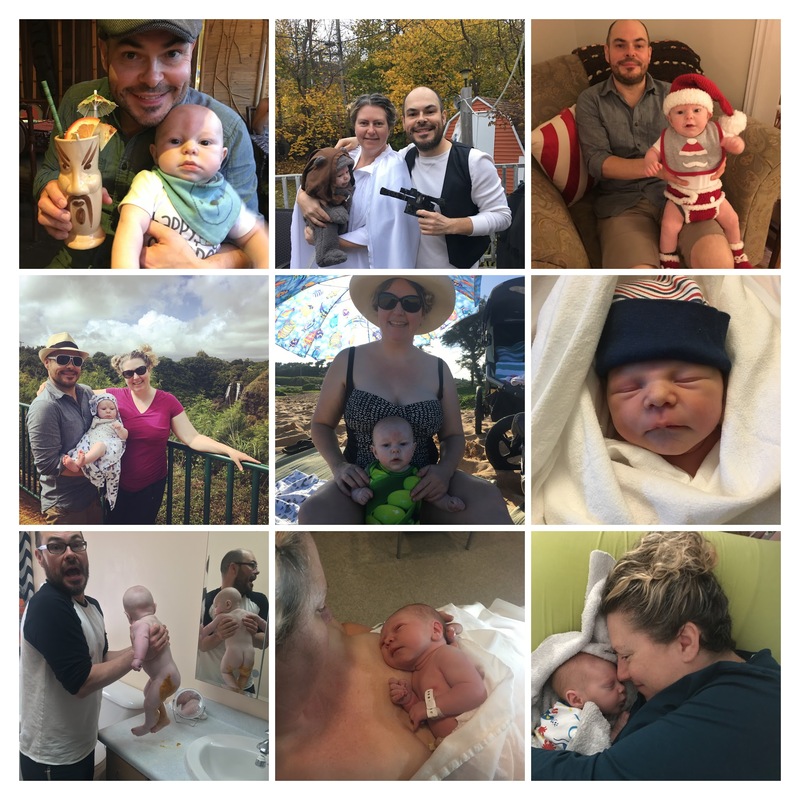 Our journey to becoming a nomadic family can be divided into 2 phases: life before and after August (our baby, not the month). In 2016 we bought a campervan and left Newfoundland to head to Vancouver. The goal was to see if we liked #vanlife or would prefer living in Vancouver, again, or would want to return to Newfoundland. Our first van trip took 30 days and over 8000 km. Our first series of videos are listed as Cross America #VanLife. Turns out we LOVED van-living and when we arrived at our 3 month sublet in Vancouver, we were slightly regretting rooting ourselves. We were eager to get back on the road. At first we based our van travels around specific milestones. We had a vacation booked in Florida with our close friends and their kids over spring break (end of March), so that was our first milestone. We drove down the west coast and across the southern states and all around the pan-handle. See: #road2florida. Spring to early summer on the coast of British Columbia, bouncing between staying with family, friends, and van living. Summer to early fall in Newfoundland staying with family, friends, and at our cabin in the woods (leaving the van in BC). Late fall back to BC to prepare for the next van adventure. Winter traveling through the US, chasing single track mountain bike trails. After an amazing spring and summer, we packed up the van and headed south again, this time all the way to Mexico. See our not-yet-completed video series: #flightofthesnowbirds. At our first stop in Mexico, we discovered that we were going to have a baby and that changed everything. We fast-forwarded our trip a little by skipping some of the Mexican destinations so that we could fly back to Canada for some of the initial health-care appointments. Once that was taken care of, we spent a month or so traveling through Arizona and Utah and then back to Vancouver Island. Instead of spending the spring in BC and then summer in NL, we remained in BC with my mom until October. August Ellory was born on Aug 22 in Victoria General Hospital. Greg’s family in Newfoundland was really eager to meet the little guy so we flew out there right after Thanksgiving and stayed until mid-January. My mom wanted to go to Hawaii for her 70th birthday so we traveled from Newfoundland all the way to Hawaii with a 5 month old. Door-to-door was a 30 hour journey and 6.5 hour time zone change! August handled it better than any of us! From Hawaii we returned to my mom’s in Sooke, BC and are now currently considering our options. We’d have to disable the airbag and have the carseat installed in the front passenger seat – although this is legal and safe, it just isn’t as safe as being in the back seat of a vehicle. We wouldn’t be able to drive for much more than an hour or 2 at a time which doesn’t work well with the long distance travel we like to do. We are using cloth diapers so we would need to be at a laundry mat every 2 days. So for now we’re staying put, getting used to being parents, and considering swapping the van for a vehicle with a towable camper. http://adventuredorks.com/wp-content/uploads/2019/02/featurednomadic.jpg 718 1280 Christina http://adventuredorks.com/wp-content/uploads/2017/02/AdventureDorks-FA-02-1-300x139.png Christina2019-02-07 07:04:102019-02-07 07:04:10What does being a nomadic family mean to us? We left Newfoundland Oct 8 & caught the overnight ferry. Question: which is worse, the guy who snores super loud or the guy who complains about the snoring even more loudly? We missed a rain storm by a day and hung out in a fabulous B&B in Dartmouth, Nova Scotia called Kninghtswood. http://adventuredorks.com/wp-content/uploads/2016/10/2016_10_09_VANLIFE_Leg1.jpg 718 1280 Christina http://adventuredorks.com/wp-content/uploads/2017/02/AdventureDorks-FA-02-1-300x139.png Christina2016-10-09 12:23:352017-02-26 00:25:33Van Life Is Happening! VLOG 10. VANLIFE 07. Moving Towards Minimalism & Last Look At Newfoundland. VLOG 12. VANLIFE 06. We had to reduce all of our stuff in order to move into the van – Cee demonstrates. Minimalism is the ticket and turns out to be quite a relief. This is the start of our road trip across the US over to Vancouver, BC. We also threw in a few clips of our departure city, St. John’s, Newfoundland. See where we’re going next – feel free to give us suggestions for great boon docking or inexpensive camping! http://adventuredorks.com/wp-content/uploads/2016/10/2016_10_16_12LeavingYYT.jpg 718 1280 Christina http://adventuredorks.com/wp-content/uploads/2017/02/AdventureDorks-FA-02-1-300x139.png Christina2016-09-30 19:34:452017-02-26 00:25:46Moving Towards Minimalism & Last Look At Newfoundland. VLOG 12. VANLIFE 06. Readying the Van for #vanlife. VLOG 11. VANLIFE 05. Gee highlights many of the upgrades we made to the van to make our lives easier on the road. You’ll see how to mount mason jars for canisters, how to use “peel n’ stick” vinyl as a decor feature and what we did to give Midnight, our cat, a hidy-hole and entrance to her litter box. http://adventuredorks.com/wp-content/uploads/2016/10/2016_10_16_11VanProgress.jpg 718 1280 Christina http://adventuredorks.com/wp-content/uploads/2017/02/AdventureDorks-FA-02-1-300x139.png Christina2016-09-29 18:50:412017-02-26 00:25:52Readying the Van for #vanlife. VLOG 11. VANLIFE 05. I’ve been wanting to build an outdoor grill that could also act as an oven at 2 Dead Birch (our off-grid cabin in Newfoundland). Rather than pizza oven style, I liked the looks of the primitive ovens that use stonework. I watched videos on natural building and primitive ovens and decided to try a combo of the two. The natural clay deposits on the property seem quite gritty so I felt it was the right ratio of sand to clay. It worked great! It’s been about a month since it was built and it’s apparent to me that my mixture was quite thin and perhaps not enough sand. It’s become quite dusty. I’m simply going to keep layering the clay over time. The layout is quite good, though! Just a quick little glimpse at our night out around the bay just off the East Coast Trail for a friend’s birthday. We were meant to go whale watching earlier but the boat was out of commission so a few of us just gathered for a campfire scoff & chat. We did it! We bought a van and are refurbishing it for a cross-country road trip. This is the before tour and we can’t wait to show you the after… if we ever get it done! http://adventuredorks.com/wp-content/uploads/2016/08/2016_08_19_VanLife.jpg 718 1280 Christina http://adventuredorks.com/wp-content/uploads/2017/02/AdventureDorks-FA-02-1-300x139.png Christina2016-08-13 01:19:312017-02-26 00:26:04Van Life, Here We Come! VLOG 08. VANLIFE 03. We did something super risky and survived it – and since we filmed it, we can share this rare footage of ice bergs with you. Never get this close to ice bergs. We took a calculated risk knowing what could happen. We’ll never do anything like this again and we discourage anyone from attempting to get this close to ‘bergs. Ice bergs can calve or roll at any moment. The tip of the ice berg really is small compared to what’s underneath – the entire thing is a floating mountain. Large pieces of ice weighing tonnes can break off from above. Though it was risky, what a thrill it was to see ice bergs so close and hear the water fizz like it was perrier! We spent a lot of time hiking & camping the East Coast Trail in Newfoundland in 2013 and also 2014. This is an amazing trail system with spectacular views including wildlife sightings such as whales, sea birds, and moose. We would hike for hours and only see a few people even on the most gorgeous summer days. You really have to check it out if you’re into hiking or trekking. There are great camp spots already set up or just haul over and make your own – as long as you leave no trace.